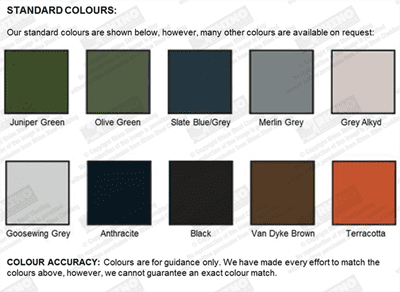 All our roofing sheets, wall cladding sheets and flashings are available in the following standard colours, many other colours are available on request. Colour sample: If you would like a free colour sample of the actual product please contact our sales team and we will be happy to send you one out. All matching colour coded fixings available. Plain Galvanised Steel – galvanised steel without any colour coating. This finish has a life expectancy of 20 years in standard environments, however, it will show watermarks and appear dull after some time. Polyester Coated – galvanised steel with a polyester smooth painted finish. This finish has a moderate resistance to scratching with a life expectancy of 25 years in standard environments. PVC Plastisol Coated – galvanised steel with a plastic vinyl coating. These sheets have a lightly textured surface, such as a leather grain, wood grain or scintilla golf ball effect. This finish has a high resistance to scratching and damage with a life expectancy of 30 years in standard environments. PLEASE NOTE! If your building is by the sea the PVC coating is advised as plain galvanised and polyester coated sheets will be affected by the salt air.